Deer often take the path of least resistance. They may seem to meander aimlessly when they are browsing, feeding on acorns, etc. However, when they travel from feeding to bedding areas they almost always take the path of least resistance that they don’t associate with danger. In some areas such as farm country where cover is limited it’s easy to find existing deer trails. Hunters in these areas often place stands along these trails. 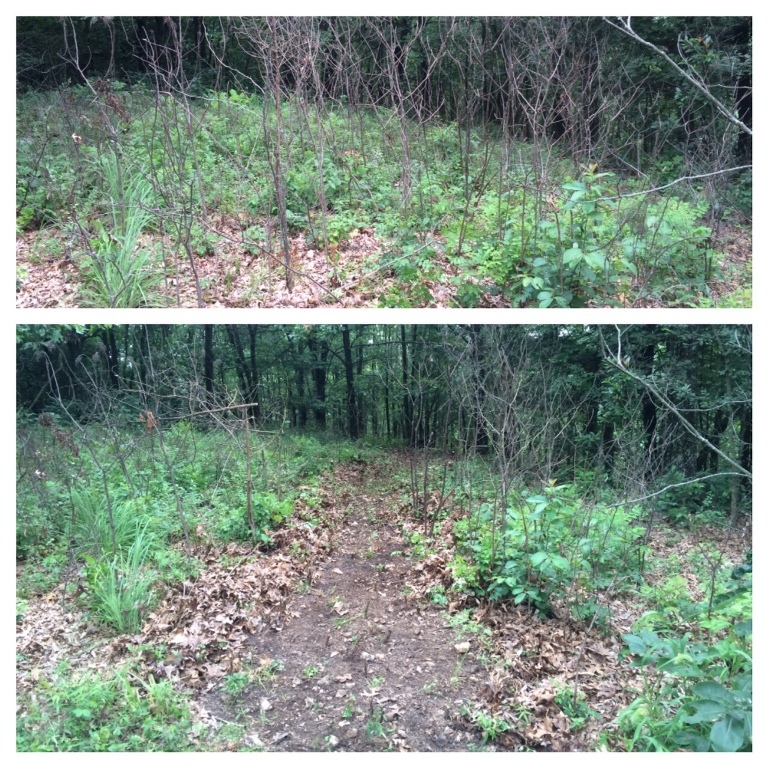 A before and after look at a path made next to one of the treestands. In areas where the landscape is primarily covered by timber deer tend to walk in general areas because cover is often similar over large areas. In timber stands that are about the same age there isn’t an obvious path of least resistance. This scenario can work in a hunter’s favor because it is easy to create a path of least resistance where it’s an advantage to hunters! By using a handsaw, weed eater, backpack blower, and/or a garden rake it’s easy to create a path of least resistance! I’m amazed at how fast deer will adapt to trails created using this simple technique. Keep in mind deer aren’t going to travel hundreds of yards simply to use such a trail. However, if deer pass within 100 yards or so of an area (but not on a specific trail) they will often adapt and bottleneck down to using a path created as described above. If you are frustrated because deer seem to wander in general areas rather than use a trail try creating a path of least resistance. It’s a great technique that can help add venison to your freezer!